Looking for fun & friendship? Join Lap-Chee Table Tennis Club and all your expectations will be satisfied! As a newly established team, we are planning at least 3 major tournaments throughout the year. Winners and active participants will be awarded with fancy prizes! An inter-college competition will also be held, where all Lap-Cheers are encouraged to fight or cheer for our beloved college! What’s more, we analyze practical Table Tennis skills, watch games and play a lot of interesting bonding games! Most importantly, we will definitely be the group that work and play the hardest! We are not only looking for those who possess excellent skills, but those with devotion and continuous enthusiasm towards the sport and our hall as well! 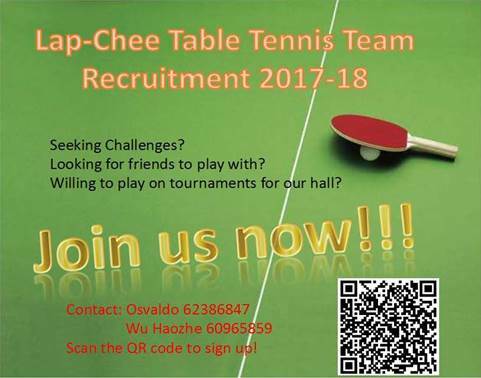 Join the Lap-Chee Table Tennis Team right now and feel the homely atmosphere and warmth from your teammates for the year to come! You don’t even have to know a lot about Table Tennis beforehand. ALL YOU NEED IS A HEART FULL OF DETERMINATION! Scan the QR code for membership registration below and register for our various Orientation Activities on September 23rd via https://goo.gl/DX6XzS now!